Gall bladder (GB) duplication is a rare condition often found incidentally; most of these detected on screening Ultrasonography (USG) for abdominal colic. Nuclear hepatobiliary scan, popularly known as hepatobiliary iminodiacetic acid (HIDA) scan, with its biliary kinetics, is highly specific for picking up abnormalities related to biliary tract and GB. We report two cases of duplication of GB visualized on HIDA scan. First case highlights the role of HIDA scan in diagnosis of duplicated GB, where USG was equivocal with a number of differentials, whereas in the second case, HIDA helped to rule out obstruction in this case of duplicated GB identified on USG; ruling out biliary cause for the abdominal colic. Duplicated GB is often picked up on Ultrasonography, however there are a lot of differentials. Since, 99m Tc HIDA follows hepatobiliary physiology, any tracer concentration in GB fossa is confirmatory for presence of GB, thus in turn increasing the specificity in picking up anatomical variants as in our case. A 15 year old boy presented with intermittent pain in right hypochondrium for a week. Physical examination revealed no local tenderness. Liver function parameters were normal. Ultrasonography (USG) of the abdomen revealed two cystic formations in the gall bladder (GB) fossa with no distinct visualisation of cystic duct. No GB wall thickening was noted, thus ruling out GB diverticula. Differential diagnosis of choledochal cyst and duplicated GB was given. Patient was then referred for a 99m Tc hepatobiliary scintigraphy. After fasting for 6-8 hours, 5 mCi of 99m Tc mebrofenin (HIDA) was injected intravenously and dynamic images were acquired for 1 hour, at a frame rate of 1 minute/second. Images revealed normal hepatocellular tracer extraction with visualization of the hepatic and common bile ducts at 10 minutes. Two foci of tracer uptake were seen in the region of GB fossa [[Figure 1]a-arrows] at 15 minutes, which persisted till the end of the study. Anterior static pre fatty meal image showed two intense foci of tracer uptake in GB fossa [[Figure 1]b-arrow]. Patient then consumed a fatty meal. Post fatty meal anterior static image showed reduction in size and counts in both structures in GB fossa [[Figure 1]c-arrows]. Detection of two globular structures in GB fossa, which contract after fatty meal, is specific for duplicated GB. It was further confirmed by drawing regions of interest (ROIs) on GB moieties, on pre and post meal images, which showed reduction in counts by more than 50%. Since GB visualization was within normal time range, with preserved contractile function post fatty meal, patient was kept on medical therapy, low fat diet and antibiotics, and follow up was recommended. An 8-year-old boy presented with recurrent abdominal pain and occasional vomiting since a few months. Liver function tests were normal. USG of the abdomen showed two pear shaped structures in the GB fossa, seen as two adjacent anechoic structures oriented in the same plane [Figure 2]a-arrows]; consistent with duplicated GB, with separate cystic ducts. Coronal Magnetic Resonance Imaging (MRI) showed the duplicated GB [[Figure 2]b-arrows]. After adequate preparation, serial static 99m Tc mebrofenin hepatobiliary study was performed; images being acquired in anterior, right lateral and right anterior oblique views every 2-5 minutes. Static anterior images showed two distinct moieties in GB fossa [[Figure 3]-arrow and arrowheads], confirming the diagnosis on USG and MRI, of duplicated GB. Post meal static image [Figure 4]b was compared with pre meal static image [Figure 4]a, latter showed significant reduction in GB counts (arrows), suggesting normal contraction of the GB, thus ruling out obstruction. Duplication of GB is a rare congenital anomaly, occurring in about one per 4,000 births. USG may diagnose GB duplication if the viscera are located separately. Differential diagnosis based on sonographic findings include gallbladder diverticula, GB fold, Phrygian cap, choledochal cyst, pericholecystic fluid, focal adenomyomatosis, and intraperitoneal fibrous bands, which results in a diagnostic dilemma. , 99m Tc HIDA is a bile analogue which gets metabolised by the biliary pathway. Following a fatty meal, there is a physiological GB contraction, resulting in tracer excretion into the common bile duct and subsequently into gut. Thus, nuclear HIDA scan is a physiological and specific modality to pick up anomalies in the hepatobiliary tree and GB. , Also, contraction of both the GB moieties following fatty meal, rules out the presence of choledochal cyst, which is a close differential and confirms presence of duplicated GB. In cases where duplicated GB is diagnosed on USG, HIDA scan is done to rule out obstruction, as prevalence of cholelithiasis and obstruction is more in association with duplicated GB. , Both cases highlight the role of HIDA scan in detecting duplicated GB. In addition, in case 1, where USG findings are equivocal, a dynamic HIDA study with fatty meal provides diagnostic accuracy; whereas, in case 2, where duplicated GB is diagnosed, serial static HIDA study helps to rule out associated obstruction. 1. Kothari PR, Kumar T, Jiwane A, Paul S, Kutumbale R, Kulkarni B. Unusual features of gall bladder duplication cyst with review of the literature. Pediatr Surg Int 2005;21:552-4. 2. Goiney RC, Schoenecker SA, Cyr DR, Shuman WP, Peters MJ, Cooperberg PL. Sonography of gallbladder duplication and differential considerations. AJR Am J Roentgenol 1985;145:241-3. 3. Starinsky R, Strauss S, Vinograd I, Segal M. Duplicated gallbladder in a child: Sonographic appearance. J Clin Ultrasound 1991;19:575-7. 4. Ziessman HA. Nuclear medicine hepatobiliary imaging. Clin Gastroenterol Hepatol 2010;8:111-6. 5. Lambie H, Cook AM, Scarsbrook AF, Lodge JP, Robinson PJ, Chowdhury FU. 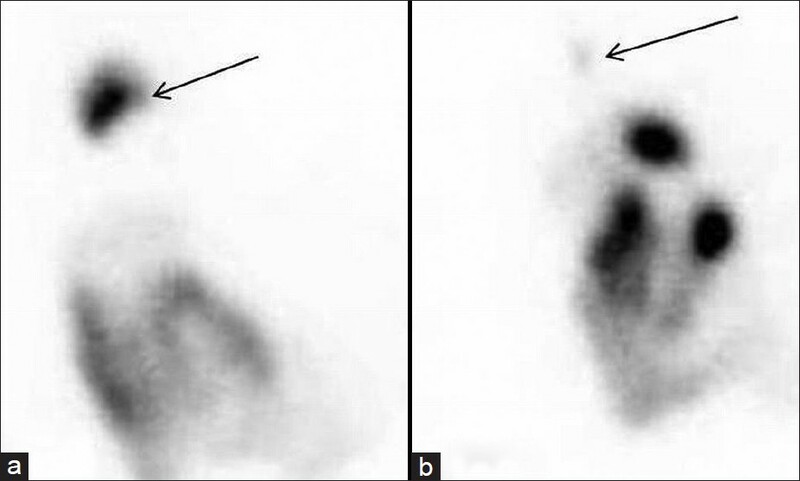 Tc99m-hepatobiliary iminodiacetic acid (HIDA) scintigraphy in clinical practice. Clin Radiol 2011;66:1094-105. 6. Gad MA, Krishnamurthy GT, Glowniak JV. 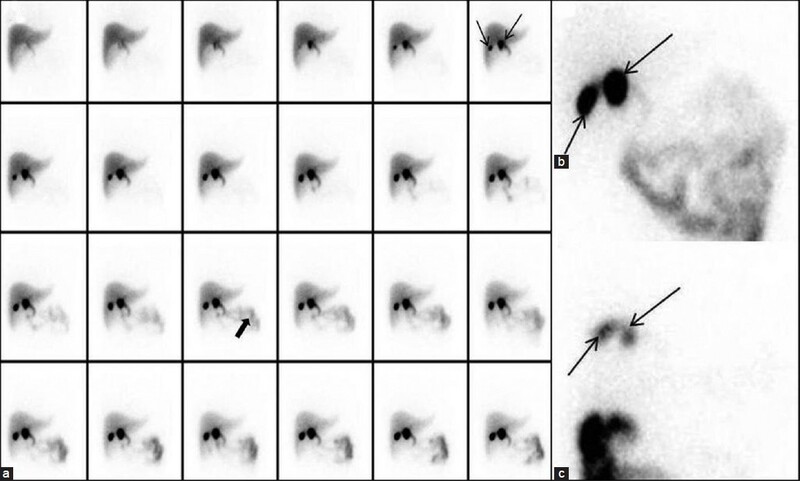 Identification and differentiation of congenital gallbladder abnormality by quantitative technetium-99m IDA cholescintigraphy. J Nucl Med 1992;33:431-4. 7. Huang BK, Chess MA. Cholecystitis of a duplicated gallbladder complicated by a cholecystoenteric fistula. Pediatr Radiol 2009;39:385-8. 8. Granot E, Deckelbaum RJ, Gordon R, Okon E, Sherman Y, Schiller M. Duplication of the gallbladder associated with childhood obstructive biliary disease and biliary cirrhosis. Gastroenterology 1983;85:946-50.